Feminist migration scholars have long argued that available quantitative data in India deny women economic agency by classifying their migration as secondary or associated with men. Thus, although women constitute more than eighty percent of all migrants, they have been considered unimportant for two related reasons: women migrate because they marry, so their migration is a social, rather than an economic phenomenon; surveys collect only one reason as the motivation to migrate and with women, marriage is often cited as the predominant reason. Ipshita Chanda’s Selfing the City, however, is about a specific subset of women migrants—single women migrants—who are not often the subject of study in migration scholarship. These are women who buck migration trends in several ways: they migrate not because they marry; their motivations are education and employment like most men; they migrate to cities unlike most women’s migration that takes place between rural spaces; they migrate alone and live largely in non-familial spaces. Chanda’s women are also largely middle-class and migrate from urbanizing towns or villages around Kolkata and form a small but highly visible fraction of migrants. Through their insistent presence, Chanda argues, these women alter the social fabric of the city even as they are also transformed through their encounters as single women living in the city. Kolkata, as the primary urban centre in the eastern part of the country, is host to a vast array of corporations and services comprising the new economy. These sectors have thrown open opportunities for women of all classes, including middle-class women. 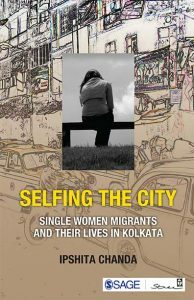 The experiences of single women from varied middle-class backgrounds that Chanda documents highlight strongly the patriarchal bases of life in the city and is a welcome addition to the corpus of scholarship on gender and the city. The foregrounding of narratives of single women in the city is a refreshing endeavour, for so little has been mapped in academia of the different ways in which such women negotiate the city. ‘Single’ in the book refers to women who live in the city in non-familial arrangements; they are not necessarily outside of the family structure but do not live in such spaces in the city. Chanda’s premise is that access to the city is mediated by the family in that it affords protection, support and companionship; single women are constrained financially, emotionally and physically without this familial backing. This premise allows Chanda to frame a distinctive subject of the single woman and the narratives in the book offer us insights into the variegated relationship of women with the structure of the family in traversing the city. Some women create family-like spaces and relationships, some choose to live in family spaces as paying guests and others cultivate wariness about everything non-familial. Relationships with existing families back home undergo changes, Chanda argues, for the practice of being responsible for every detail of one’s life transforms the self into an independent one. The control typically exercised by the patriarchal family over the woman becomes the prerogative of other figures such as the landlords and landladies, neighbourhood uncles and aunties, roommates and co-residents, among others. Different narratives in the book foreground the ways in which women resist them as intrusions, accept them as care, or retain ambivalence, choosing to fight some and letting others wash over them. One wishes, however, there had been a more rigorous engagement with the term ‘single’, because it is central to the book both empirically and conceptually. The temporality of being single was an aspect that could have been provided attention. For women who have lived away from their families, their lives as single women are often considered temporary by their families and the society (p. 98, p. 226). Their dwellings and relationships are not considered permanent; it is assumed that their single lives will give way to their own heterosexual families (p.122); this will be built not in makeshift spaces such as paying guest accommodations, hostels or messes, but in legitimate spaces such as family homes. How does this temporariness shape and affect the accommodations and adjustments that single women make or the relationships they forge? In what ways does this temporariness mark their experience of the city—does this, for instance, make terrible intrusions bearable because they will eventually pass? How does the city make use of this supposed temporariness when offering single women spaces to live? These are some vital questions around temporality that a study of single women migrants could have fruitfully explored. Yet another aspect to this singlehood is also that it is limited to Kolkata alone, i.e., it is spatially bound. Most of the respondents seemed to have families back home that they could draw from, when necessary. Chanda has noted, for instance, how some women choose to display their parents in the neighbourhoods they live in, as a means of establishing their reputation and legitimacy. While Chanda indisputably establishes that single women’s lives are subject to scrutiny and often lead to precarious situations because they are single, it would have been important to acknowledge that the women respondents in her survey still stood to benefit from having a family, even if in other towns. This does not alter Chanda’s basic premise that women’s access to the city is mediated by the family. What it complicates are her other assertions: that these specific women challenge patriarchy or existing gender norms or the hegemony of the family simply because they move away from family spaces; that women from Kolkata somehow lead easier physical and emotional lives only because they have families in the city. The analysis presented in the book would have also benefitted from a systematic categorization of the respondents based on language, age, profession and other criteria to present a far more nuanced understanding of what being single entails. For instance, the distinction between ‘Mems’ vs ‘Bangla types’ that some of Chanda’s respondents raise (p. 110) could have been fruitfully explored for how class positions determine singlehood in the city. A distinction between the phenomenon and the individual is a remarkable absence in the book. The phenomenon of the single woman migrant may challenge patriarchal expectations of the correct place and life for a woman, but individual women could very well negotiate the city within patriarchal limits to their conduct, willingly or with coercion. Their experiences of and in the city are marked by the challenge they pose to the structure of patriarchy, as Chanda poignantly points out through several anecdotes. But it is not at all apparent to the reader if the individual women in this book are driven by some feminist desire to challenge existing gender norms. Women who migrate or have migrated are not necessarily driven by some feminist motivation to blaze a path for others who follow them. They do so because it offers them, individually, new avenues for growth—educationally, in careers or in leading self-sufficient lives. The women in the book come across rather as individuals willing to negotiate with, and co-opt, patriarchal diktats, to suit their own ends of making a life in the city. Further, none of the generations of women surveyed in the book self-identified themselves as feminist in their excerpted responses. It is strange then that Chanda repeatedly presents their migration as part of some considered feminist intervention rather than as squarely driven by capitalist processes of urbanization (p. 37, p. 53, among others). Women’s migration to the city, singly, certainly requires feminist research and action and in the absence of state-sponsored aid, feminist endeavours can be directed towards creating platforms that allow for supportive spaces. Chanda’s book provides great resources for understanding this phenomenon but does not support her assertion that this migration is by feminist design. Apart from the term ‘Single’, the book would have benefitted from an engagement with migration itself. Chanda may seek to designate her respondents as ‘women from outside’, rather than as migrants (p. 4), and may choose to posit her respondents’ lives in contrast to women from the city. But this does not take away from the fact that the uncertainties of being a migrant mark the experiences of even these single women migrants. The tenuousness of kinship ties, the precarity of residence, the fearful sense of being an outsider in a city, and the alienation and loneliness that follow are emotions that Chanda dwells sensitively on but fails to locate structurally as part of migrant experience. Situating it along with other categories of migrants such as those who migrate with families or single male migrants does not diminish the particularity of the single woman migrant’s experience. Instead, the commonality of migrant experience across classes and genders allows us to understand the intimate effects of living in globalizing cities. As scholarship emerging from fields of urban studies and migration shows, many kinds of lives are unwelcome in the city for they destabilize notions of what cities should look like and who cities belong to. Poor migrants, slum residents, and refugees are some such categories of unwelcome population, all of which have special valence in Kolkata, with its histories of Partition, migration and now as a globalizing city. Situating the single woman migrant in this spectrum of unwelcomed lives would have helped to bring the frames of migrant experience and the globalizing city together as structural elements that shape the self of Chanda’s subjects. Swathi Shivanand is a doctoral candidate at Jawaharlal Nehru University, New Delhi, with a long-standing interest in the urban. For a detailed analysis, see, among others, Indu Agnihotri, Indrani Mazumdar, and Neetha N, ‘Gender and Migration in India’, in Internal Migration in India Initiative, Vol. 2: Workshop Papers (National Workshop on Internal Migration and Human Development in India, New Delhi: United Nations Educational, Scientific and Cultural Organisation (UNESCO), 2011), 134-65.